Fortingall is a small village in the heart of Perthshire, at the entrance to Glen Lyon, not far from Loch Tay. The yew tree which grows there has been estimated to be at least 3,000 years old and possibly as old as 5,000 years. It is certainly the oldest living organism in Britain and possibly the world. It's girth at one stage was over 56 feet when measured in 1769. In the last few hundred years, as its fame grew, souvenir hunters began to take large sections of the tree and eventually a wall had to be built round it to protect it. Some of its branches only survive because they are propped up. Recently, tree surgeons took cuttings from the surviving branches. These will be grown by the Forestry Commission at Roslin (near the research lab where Dolly the sheep was cloned) and will then be planted in woods around the country, including the arboretum at Scone Palace. So the Fortingall Yew will live on for perhaps another few thousand years as a clone, even if the original eventually does not survive. Early people revered the yew tree and they often marked a place of worship. The church now standing beside it is relatively modern but close by Fortingall is a Neolithic cairn, a standing stone and the site of a medieval homestead. The church itself has a font and a 7th century bell which are said to have been used by St Adamnan. Yew trees have often been the source of myths and legends. Before the arrival of Christianity, the yew was regarded as the "tree of eternity". They are often long-lived and have a habit of starting to grow again after they are about 500 years old. There is a local tradition that Pontius Pilate was born near the yew and spent part of his childhood there before he got blamed for the death of Jesus. While the tree is certainly old enough to have been around at the time, the Roman invasion of Britain (far less the wilder parts of Alba) did not start until 43AD. 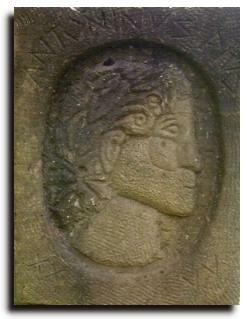 Julius Caesar landed in southern Britain in 55BC but did not advance into Scotland. The venerable yew is being pressed into service by the local Tourist Board who are marketing it as part of "Big Tree Country". 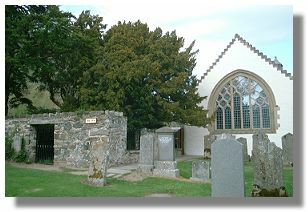 The Fortingall Yew is being joined by the Dunkeld Larch (planted a mere 250 years ago, but one of the first of its type planted in Scotland) and the Birnam Oak (the last remaining tree in a wood made famous by Shakespeare) as part of a scheme to improve around 40 forest sites in Perthshire. A "time line" of Caithness slabs has also been set up at Fortingall to put the lifetime of the tree into a historical perspective. These have carvings to illustrate major historical events which occurred during the lifetime of the tree. 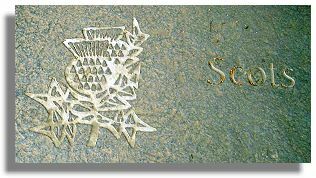 The illustration here marks the arrival of the Scots (from Ireland), probably around 500AD.